Peter Sagan lived up his billing as stage-two favourite by making a late charge for victory, on a day that saw Richie Porte and Alberto Contador lose crucial time on the Tour de France general classification contenders. 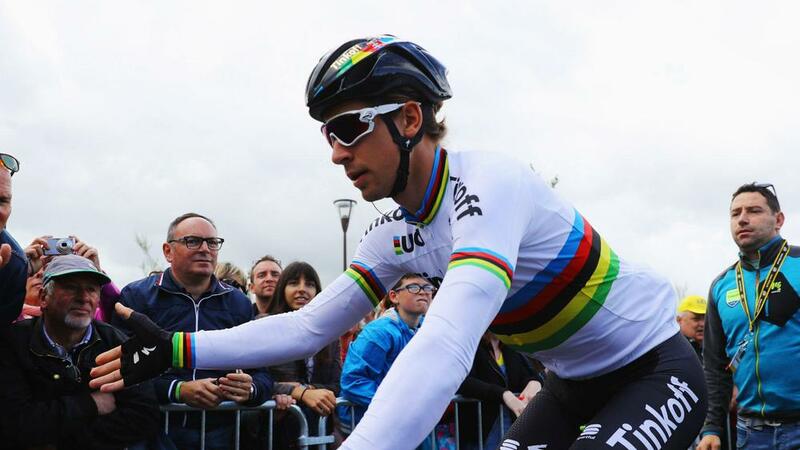 World champion Sagan (Tinkoff) was heavily fancied for the 183km ride from Saint-Lo to Cherbourg En-Cotentin, which favoured sprinters able to contend with hill climbs. For long periods it looked as though breakaway leader Jasper Stuyven (Trek-Segafredo) may have enough to hold off a peloton that left it late to reel in the gap after a major crash, which claimed Contador as a victim. But as the final kilometre approached Stuyven, who will wear the polka dot jersey for King of the Mountains leader, was reeled in and it was Sagan who showed his class to take the win and ownership of the yellow jersey for the first time in his career. "Yeah, it's very nice. It's first time in my career," Sagan said. "Unbelievable. I am very happy for this. Yellow for the first time is something special." However, there was disappointment for Porte (BMC Racing) who lost almost two minutes on his main rivals having suffered an innocuous puncture with just under five kilometres remaining and he faces a huge task to salvage his Tour already. Contador (Tinkoff) also toiled having crashed for the second day running. The Spaniard spoke pre-race of the difficulty he had sleeping following his stage-one crash and he took another tumble after around 60km and is around 50 seconds off his rivals. An initial four-man breakaway saw Cesare Benedetti (Bora-Argon 18) snap up maximum points on the stage's intermediate sprint. Benedetti eventually fell away, but the remaining trio – including Stuyven - fought valiantly in a bid to cling on to an unlikely win. Stuyven eventually decided to go it alone and at one point it seemed as though he may get the job done. He was swallowed up, though, and Sagan held off the attention of Julian Alaphilippe (Etixx - Quick Step) and Alejandro Valverde (Movistar) to take the win in a bunched sprint. Defending champion Chris Froome comfortably came home with the rest of the peloton and placed 10th on the stage.